With its unique atmosphere, stylish décor & superb cuisine, Thula Thula offers you the choice of exclusive accommodation between the four-star Luxury Elephant Safari Lodge, renowned gourmet destination, & the four-star Luxury Tented Camp, offering an authentic African bush experience, serving Traditional South African Home Cooking, in the heart of Zululand. Both offer a very different & unique experience. The luxurious Elephant Safari Lodge is set on the banks of the Enseleni River & offers four luxury Safari Suites, two de Luxe Rooms, the Suite Royale & the Suite Impériale. Exclusive bush experience & absolute luxury, with only 8 thatched chalets decorated in flavours of ethnic & colonial elegance, the Elephant Safari Lodge offers superb accommodation with as much privacy & comfort as you could wish; spoil yourself with a stay in our "Suite Royale”, (our honeymoon suite) or the Suite Impériale, for those special occasions.Each unit is constructed with stone & thatch with verandas overlooking the reserve. All Luxury Suites: All rooms in the Luxury Elephant Safari Lodge are equipped with the following: Air-conditioning, tea & coffee making facilities, filter coffee plunger with locally ground coffees, bottled water on arrival, two pin adaptors, extra blankets, electric blankets, mosquito nets, ample cupboard space, toiletries, towels & robes, en-suite shower, dressing table & mirror, hairdryer, local art & a selection of guest amenities. 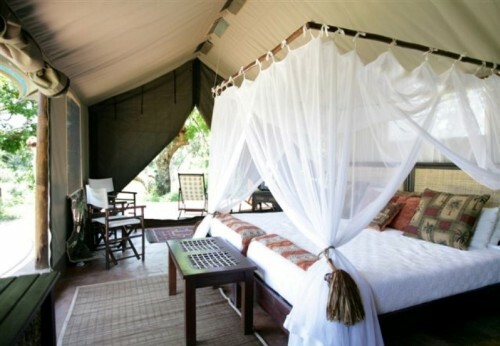 The luxurious Tented Camp consists of six luxury double tents, & two luxurious family tents. Rediscover Nature in great style & true to the African safari camp of a past era at the Thula Thula Luxury Tented Camp, where the peaceful ambience of the African bush can be heard & felt. The Thula Thula Luxury Tented Camp is approximately 2km from the Elephant Safari Lodge on the banks of the Ensleni River. Nestled in the bushveld the Luxury Tented Camp is a great opportunity to rediscover nature in an exclusive & private environment. 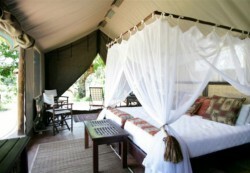 Each tent has a viewing veranda with views of the bush & river. Exclusivity is assured with only 8 luxury tents. 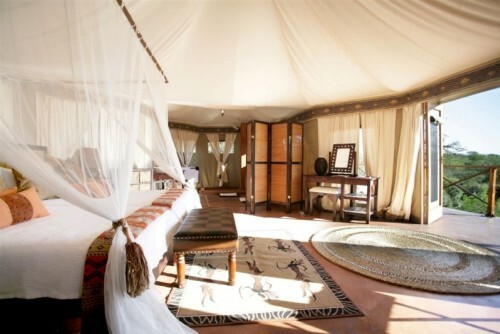 All Luxury Tents are equipped with the following: Mosquito Nets, Fans, Towels, Shower, Bottled Water on Arrival, Tea & coffee making facilities, filter coffee plunger with locally ground coffees, two pin adaptors, extra blankets, electric blankets, dressing table & mirror, hairdryer & a Selection of Guest Amenities. 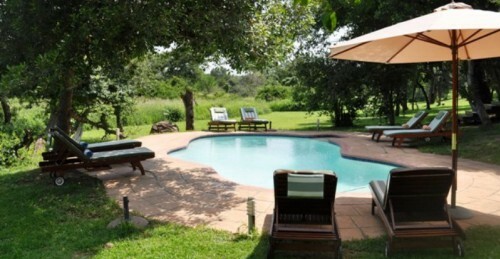 Many Extra activities include massage therapy, a cruise on the St. Lucia Estuary to view Hippos & Crocodiles, Bush Walks, Mountain Biking, Massage Therapy, Extra Game Drives, French Cuisine Cooking Classes, Horse-riding on an Indian Ocean beach, A visit to the world-famous Hluhluwe/Umfolozi Game Reserve or visit to the local rural Zulu village of Buchanana. Some activities will incur additional charges. 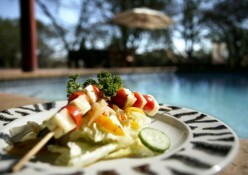 Elephant Safari Lodge: Children 8 + welcome; Children from 8 to 11 years old pay 50% of adult rates when sharing with 2 adults; Children under 8 welcome by prior arrangement. Children under the age of four years are not allowed on game drives or bush walks, but may be permitted to participate at the discretion of the Head Ranger. 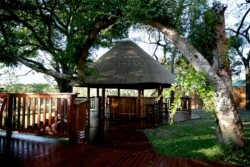 Special children’s bush walks are done by the Rangers around the Lodge / Tented Camp grounds. 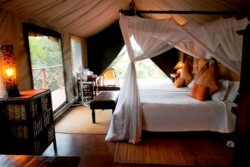 Luxury tented Camp: Children under 12 years old pay 50% of adult rates when sharing with 2 adults. In order to upkeep the meaning of Thula Thula, which is peace & tranquillity, we all need to respect each other’s peace & nature, please refrain from letting your children from playing at the communal area with noisy toys i.e. scooters, balls, games & bicycles etc. If a babysitter is required, please arrange timeously with Management. The rate is R 35 per hour. All bookings will be considered to be provisional bookings. In order to confirm a booking, a deposit of 50% of the total stay or package is required.. In the event of non-payment of a deposit, the lodge reserves the right to cancel any bookings without notice or liability to the client. Full payment must be made 6 weeks prior to arrival. Less than 7 days, forfeit the full deposit; * From 7 – 14 days, forfeit 75% of the deposit;* From 14 – 21 days, forfeit 50% of the deposit;* From 21 – 28 days, forfeit 25% of the deposit; * From 28 days: 20% admin & bank charges cancellation fee. * Early departure – no refund. * Note: Group bookings of 6 rooms or more in either Safari Lodge or Tented Camp, will forfeit the entire deposit if cancellation is not done 60 days or prior to arrival. Luxury Suites: All rooms in the Luxury Elephant Safari Lodge are equipped with the following: Air-conditioning, tea & coffee making facilities, filter coffee plunger with locally ground coffees, bottled water on arrival, two pin adaptors, extra blankets, electric blankets, mosquito nets, ample cupboard space, toiletries, towels & robes, en-suite shower, dressing table & mirror, hairdryer, local art & a selection of guest amenities. de Luxe Room: x2 (№3 & №5) - The deluxe rooms are approximately 25m²; with queen- sized four-poster bed, en-suite bathroom with single basin & shower & a veranda which overlooks the bush. The deluxe rooms are ideal for single occupancy. Luxury Safari Suite: x4 (№1, №2, №4 & №6) - The Luxury Safari Suites are approximately 35m², 3 of the luxury chalets have 2 ¾ four-poster beds & 1 of the chalets has a queen- size four-poster bed. The en-suite bathroom has twin basins & a bath & shower en-suite. Each luxury chalet has a veranda which overlooks the bush. Additional single beds for children available on request. Suite Royale: x1The Suite Royale is perfect for honeymooning couples; with a large king- size four-poster bed. The Suite Executive Suite Royale is approximately 75m²; has a separate lounge area, en-suite bathroom with large walk in shower, bath with bush view & twin basins. 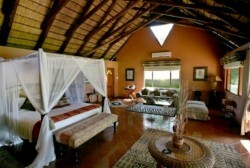 Suite Royale has superb bush views & a veranda which overlooks the watering hole. Suite Impériale: x1 The Suite Impériale is approximately 80m²; with two double, four-poster beds, lounge area with chez longue, en-suite bathroom with large walk in shower, bath with bush view & twin basins. Suite Impériale has superb bush views & a private deck which is ideally situated to watch the sunset over the waterhole & African bush. 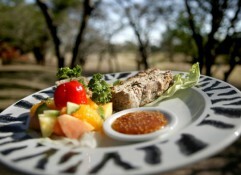 Elephant Safari Lodge Cuisine: Dining at Thula Thula Elephant Safari Lodge is not just about eating, it is an experience to be savoured. It should delight the diner’s senses – the sights, the smells & the tastes. What better way to experience this than under the African skies at Thula Thula where a fusion of the most delicate fare is combined with exotic flavours & enhanced with the finest South African wines. A superb selection of seafood, venison & delectable vegetarian dishes are served by candle light, accompanied by the sounds of the wild, earning Thula Thula Private Game Lodge a reputation as one of the most renowned gourmet destinations in KwaZulu-Natal. 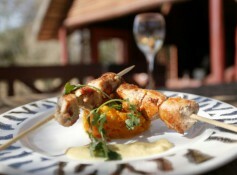 Owner, Françoise Malby brings French flair into every dish. Under Françoise’s guidance, the chefs of Thula Thula ensure the Elephant Safari Lodge is remembered as much for its food as it is for the peace & tranquility that surrounds it. Candle-lit dinners are served either in the dining room around the pool on the veranda, watching wildlife visiting the nearby waterhole, or in the Boma seated around a roaring fire under the magnificent star-lit African sky. Thula Luxury Tented Camp Cuisine: Diners in the tented camp enjoy a delicious & wholesome South African menu served in the boma (weather permitting) including potjiekos (traditional South African stew cooked in a large three-legged pot), a selection of braaied meats (barbecue), boerewors (traditional South African farmer’s spicy sausage), chicken pieces, pap & chakalaka, samp & phutu, as well as traditional South African desserts such as melktert & lemon meringue pie. 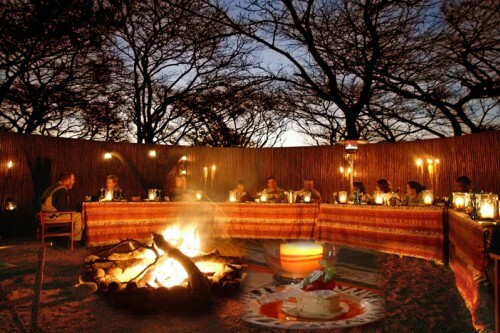 Dine under the stars in the boma & enjoy traditional South African home cooking while sharing stories of the day’s game viewing with our dedicated rangers & trackers & other guests. At Thula Thula Safari Lodge, discover a fusion of the most delicate fare combined with exotic flavours and enhanced with the finest South African wines which brings to the culinary experience a sense of occasion, everyday. 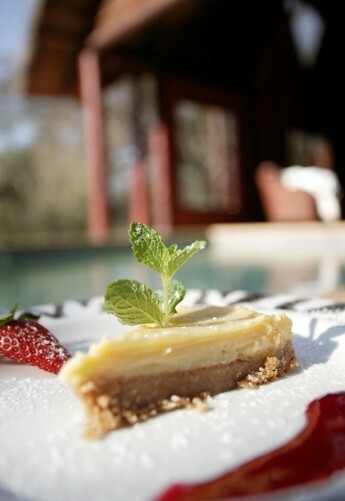 Thula Thula’s Culinary Courses have been designed by charismatic owner and French trained chef, Francoise Malby-Anthony. Francoise who hones her skills each year at the LeNôtre Culinary Institute in Paris, describes her cooking as ‘Franco-Zulu’ inspired cuisine, and her menu includes creative interpretations of traditional dishes such as Seafood Bouillabaisse Creole and Oxtail Bourguignon as well as sublime desserts, including the lodge’s legendary handmade Nougat Glacé. Under Francoise’s skilful guidance, course participants will learn the techniques of a pro, whilst immersed in the pristine African bushveld. FROM JOHANNESBURG (5 - 7 hours) - Take the N2 out of Johannesburg towards Kwazulu-Natal through Mpumalanga. Drive past Ermelo, Piet Retief & Pongola. At the Richards Bay / Empangeni turn-off, take the R34 to Empangeni. Drive through Empangeni, following the direction of Nkwalini / Melmoth, then turn right towards Heatonville. Follow the road for about 10kms crossing 3 railway tracks. After the 3rd track, at the T-junction turn left onto a dirt road; follow the road upward for about 8kms until you see a sign for the D312 and Thula Thula; turn right and travel for another 2kms to the Thula Thula main gate. N.B. From the Heatonville turn-off the road is signposted. (N.B. Do not turn left at the “Thula Thula Private Residences” sign; continue on straight). (The gate of the game reserve closes at 17:00. Should you wish to arrive later than 17:00, please inform the game reserve. Take the N2 out of Johannesburg towards Mpumalanga. Drive past Ermelo & Piet Retief; take the turnoff to the R33 towards Paulpietersburg / Vryheid. At Vryheid, take the R34 to Babanango / Melmoth. Drive past Melmoth; when you get to Nkwalini, turn left to Empangeni (R34), drive for 36kms & take the second turn-off left to Heatonville; Follow the road for about 10kms crossing 3 railway tracks. After the 3rd track, at the T-junction turn left onto a dirt road; follow the road upward for about 8kms until you see a sign for the D312 & Thula Thula; turn right & travel for another 2kms to the Thula Thula main gate. N.B. From the Heatonville turn-off the road is signposted. (N.B. Do not turn left at the “Thula Thula Private Residences” sign; continue on straight). (The gate of the game reserve closes at 17:00. Should you wish to arrive later than 17:00, please inform the game reserve. FROM DURBAN (2 Hours) - Take the N2 (Stanger) north-bound to Empangeni. Have money ready for toll fees (± R50.00). At the Empangeni turn off take the R34 to Empangeni. Drive through Empangeni, following the direction of Nkwalini / Melmoth, then turn right towards Heatonville. Follow the road for about 10kms crossing 3 railway tracks. After the 3rd track, at the T-junction turn left onto a dirt road; follow the road upward for about 8kms until you see a sign for the D312 & Thula Thula; turn right & travel for another 2kms to the Thula Thula main gate. N.B. From the Heatonville turn-off the road is signposted. (N.B. Do not turn left at the “Thula Thula Private Residences” sign; continue on straight). (The gate of the game reserve closes at 17:00. Should you wish to arrive later than 17:00, please inform the game reserve. FROM THE DRAKENSBERG AREA (4 – 6 Hours) / FROM JOHANNESBURG (6 – 8 Hours) - Drive to the N3 & follow the N3 towards Durban, passed Howick / Pietermaritzburg. Drive passed the Pavilion Shopping Complex. Take the N2 North & follow directions as Durban above. Transfers can be arranged from King Shaka or Richardsbay airport or elsewhere.